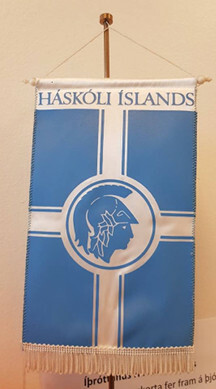 The symbol of the University of Iceland sits on a blue flag with a white Nordic cross, the symbol where the lines meet. It also has some blue lines inside the white ones. Based on this description and on the proportions of the Icelandic national flag, I have drawn the flag of the University of Iceland, with its central detail as shown below. 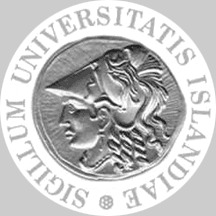 This shows an old coin surrounded with the Latin motto "Sigillum Universitatis Islandiae" (Seal of the University of Iceland).